As I opened the door last Thursday evening, Bella, my beautiful long haired orange and white kitty darted out. This was the beginning of this funny cat story. She refused to return after hearing my pleading calls. I went to bed and in the night heard our pack of eight Cahuilla Hill’s coyotes, their howling fairly close to the house. I went outside and called again. No Bella. In the morning, after a night out, she is usually at the door, sometimes with a couple of mice for my pleasure. Friday morning there was no Bella. I sat on the patio and at last heard meowing. I checked under her favourite hiding places. No Bella. 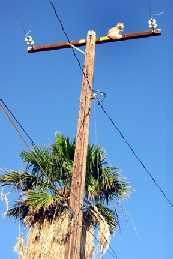 At last I looked up and there she was on this towering telephone pole with dangerous electrical wires. I called the fire department, but was told that they can no longer come out for cats on poles or in trees. No luck. I called Edison and they promised to come. The temperature was soaring to over one hundred degrees and there she was, looking down at me for help, moving around occasionally, with pleading eyes. I called Edison three more times, but no one appeared, but at two-thirty, three young, concerned construction workers came up and said they had been working next door and saw my cat on the pole. They were worried because it was so hot. At this stage it was no funny cat story. These determined souls called their construction friends, and ten minutes later a cherry picker of sorts appeared. It looked more like a machine which moved pallets with a forked end. They used a pallet in this fork and slowly raised it between the wires, with a blonde young man harnessed to the side poles. He had water in a cut off plastic cup to give to her immediately. Slowly, slowly up he went and at last he reached her, talking gently to her before he picked her off the pole to safety. Slowly between the wires they came down to safety, and yes, I cried tears of joy! We brought her in the house, she could barely move, so we put the water in front of her tired stretched out body and she drank, and drank. And she is back to normal. Had she not climbed the pole, I feel certain she would be dead. Coyotes love cats. Thanks to these modern day heroes, Bella survived and this event turned into a funny cat story ! Next Post:Four Week Old Kitten?